Many of you may know Jess, who is a frequent contributor to It’s Conceivable, and has been bravely blogging about her experience going through the open adoption process with her wife Carla. Jess goes on to detail how their counselor proceeded to ask for more and more changes to their profile, even after they had made her edits. When the counselor asks for a draft of their profile a third time, Jess and Carla put their collective foot down and decided not to make any more changes. When I first read this, I found it a bit hard to believe that “sharing more struggle” would be a piece of feedback. Jess and Carla are obviously head over heels in love. They have loving, supportive families, and they want to share that love with a child. But perhaps this counselor knows best what works – after all, I’m half a country away, a lowly editor who does not work in the adoption field, reading and hearing about these processes third-hand. But I could sense Jess’ frustration through her post – and was glad they finally decided to stop the profile-editing madness and go with their gut about what represented them as a couple. So when Jess offered to share their final adoption profile, I was quite curious. Would it be too happy-go-lucky? Too long? Still need some editing after all? When I saw their profile, those questions flew out of my head. I teared up going through it. It was thorough, thoughtful, and sincere. In my opinion, Jess and Carla’s desire for a child comes through on every page, and frankly, it broke my heart a little to think they had gone through the wringer for something so full of love. These ladies are ready for a baby! 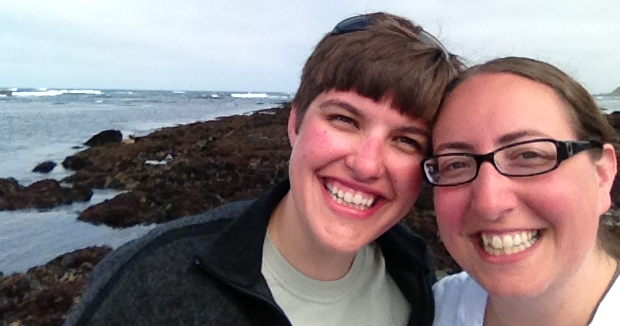 Jess and Carla have generously offered to share the Adoption Profile here for those going through a similar process. If you come to the same conclusion as me, namely that these ladies are ready to be awesome parents, give her a shout-out in the comments below or on her blog, Two Mommies Trying to Adopt. I know I’ll be rooting for them. View Jess and Carla’s Adoption Profile here.